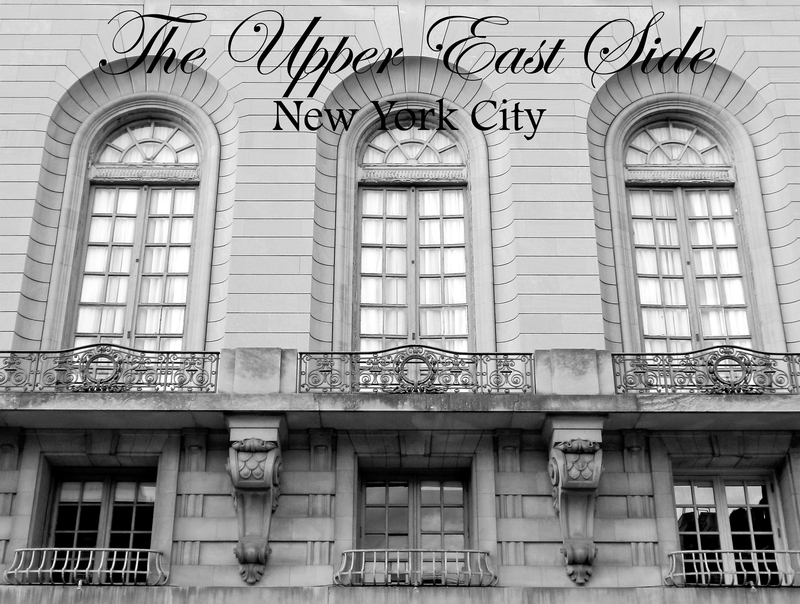 The Upper East Side of New York City has long held a reputation of wealth, prestige, and class. Throughout the past few hundred years, especially throughout the Gilded Age, amazing mansions and architectural marvels have sprouted up along the famed streets known as Fifth Avenue, Madison Avenue, and Park Avenue. In Part one of The Upper East Side, New York City, enjoy the sights of some of the most impressive homes, interesting historical accounts, and hair raising scandals. Park Avenue was once a low-key street littered with brownstones and small shops. Today, with the help of the Jonathan Bulkley mansion, this bustling street is one of the most elegant, prestigious strips in Manhattan. In the late 1800s, most wealthy residents constructed their townhouses to face the side streets away from the main avenue. When the railways were introduced to the budding street, their smoke created a less than favorable atmosphere for the millionaire developers. After 1902, the trains switched to electric and a new age of mansions facing Park Ave emerged. 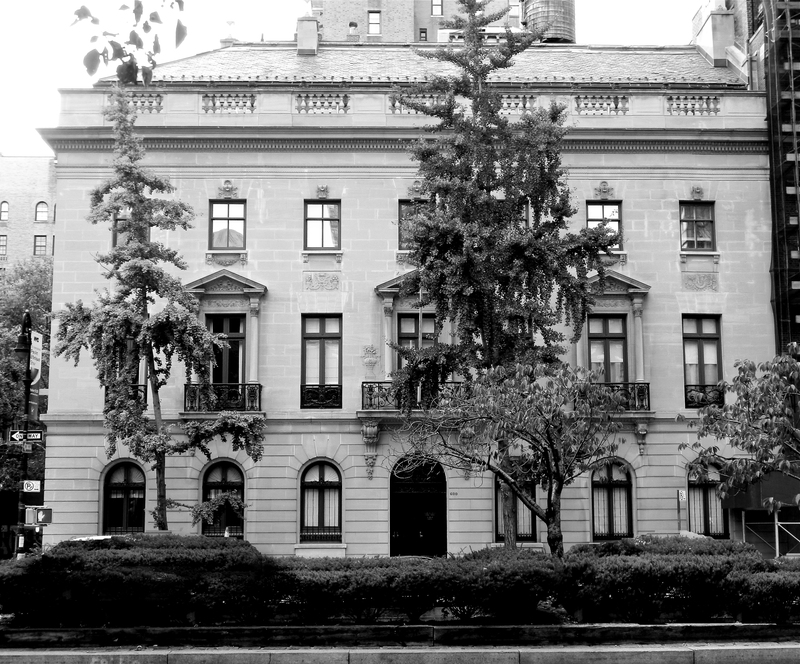 In 1909, Jonathan and Sarah Tod Bulkley watched the construction of their 600 Park Ave mansion begin. Seven other luxury homes were developed along the avenue not long before the Bulkley’s ambitions pursuit. Costing $40,000, the limestone masterpiece was built by James Gamble Rogers, who also created the Harkness Tower at Yale University. Mr. and Mrs. Bulkley and their children were catered to by eight staff members and lived in the 8,800 sq ft mansion until they passed several decades after the home was built. In 1939, Jonathan Bulkley died followed by Sarah in 1943. The home sat vacant until the Swedish government purchased the property in 1946. In 1905, Sara Delano Roosevelt made a promise to her son that any person would love to receive. She decided she would build a townhouse in the Upper East Side community for her son Franklin, who would one day be an American president, and his wife Eleanor. The stunning townhouse was completed at the end of 1908 and was presented to the young couple soon after. Gleefully, Franklin, Eleanor, and their children James and Anne moved in to the New York treasure. Franklin and Eleanor lived in No. 49, and Sara, Franklin’s mother, lived next door in the joining No.47 on East 65th street. In this home, Franklin launched his successful political career, ultimately landing him as the 32nd President of The United States of America. In 1921, just after completing his work as Assistant Secretary of the Navy, Roosevelt was diagnosed with polio, which infamously affected his ability to walk. 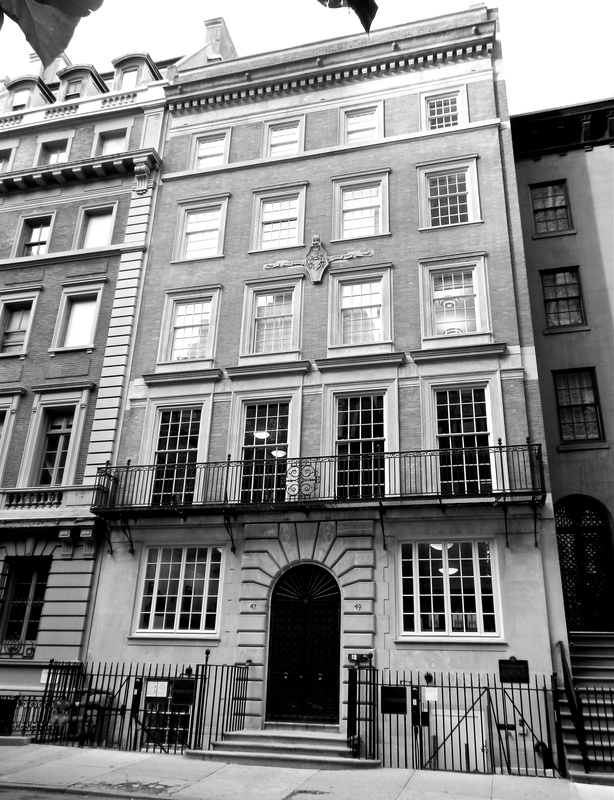 The Roosevelts developed a strong bond with nearby Hunter College while living at their Upper East Side townhouses. Franklin dedicated a building on Park Ave to the college, and Eleanor spoke and partook in various events at the school. When the Roosevelts placed No.49 and No.47 on the market after Sara’s death in 1941, Hunter College expressed interest in the property. The former president reduced the price and sold it to the college. In honor of Sara, the townhouse was dedicated in her name. Casting a large shadow across East 91st and Fifth Avenue, Andrew Carnegie’s former sixty-four-room mansion was completed 112 years ago. Today, the estate that demanded three years of construction, and was the first residential building to have a steel frame in America, serves as the Cooper Hewitt, Smithsonian Design Museum. More on the Andrew Carnegie Mansion will appear at a later date. 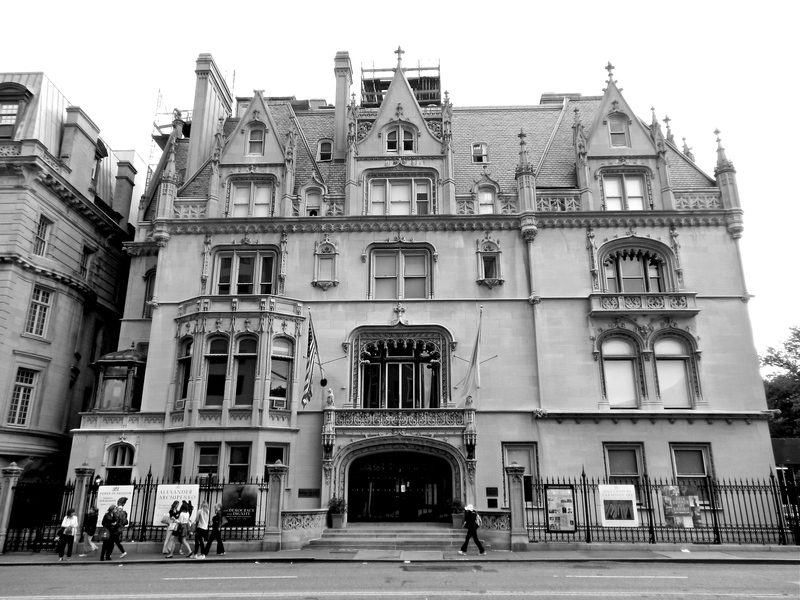 This beautiful, yet eerie mansion sits on the corner of East 79th and Fifth Avenue. Owned by railroad investor Isaac Fletcher until his death in 1917, the C.P.H Gilbert designed structure was completed in 1898 in the French Gothic style. The limestone estate was gifted by Fletcher to the Metropolitan Museum of Art after his passing. Along with the structure, his will included 251 pieces of art. More on the Isaac D. Fletcher Mansion will appear at a later date. In 1837, Gertrude Rhinelander, a woman of unique flair and bold taste, was born to a wealthy New York City family. Remaining in New York throughout her life, she married stockbroker Francis Waldo in 1876. Having recently felt the turmoil of an economic disturbance in 1873, Waldo was left with not much to offer financially. Just two years after getting married, Francis passed away in 1878 leaving Gertrude a widow at 41 years old. In 1882, Gertrude Rhinelander Waldo purchased a plot of land in the Upper East Side. Located at the corner of 72nd and Madison Avenue, she chose not to build immediately. Instead, she took shelter at her sister Laura’s neighboring home across the street. After years of speculation from the press over what Rhinelander Waldo would build on her city plot, she finally set out the plans in 1893 from her Hotel Savory apartment. Construction began in 1894 on the massive Limestone mansion, and a smaller home was built in the neighboring lot just behind the soon to be palace. Done in a French Renaissance Style, the home was never lived in by Gertrude. Instead, she is rumored to have stayed with her sister for the duration of her life. In 1914, Gertrude Rhinelander Waldo passed away. According to The Times, she died over $100,000 in debt. Today, The Gertrude Rhinelander Waldo Mansion is the flagship store for Ralph Lauren. The company has paid excessive millions to restore the structure to its original beauty. In 2005, the building sold for $80MM. 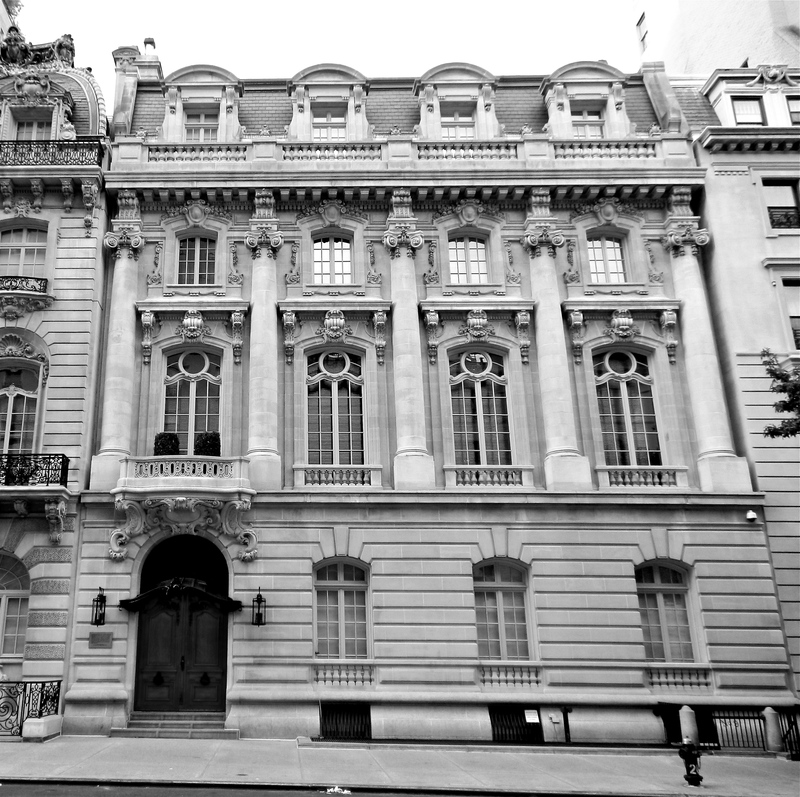 A lover a music, art, and Italian styled architecture, Otto Kahn gifted New York City with an amazing French Limestone mansion that would set the tone for future residences in style, magnitude, and presence. Soon after his 1896 marriage to Adelaide Wolff birthed a new, powerful couple, the two employed the likes of C.P.H Gilbert and J. Armstrong Stenhouse to begin the design and construction on what would become one the most impressive, unrivalled homes in Manhattan. Showcasing a strong Italian Renaissance style, Kahn’s house was built to allure spectators with its Limestone from St. Quentin, France. With such a love of the arts and the people who surrounded his home and neighborhood, the Otto Kahn House often opened its massive, rich doors to the public to showcase various musical performances. As well as the fine strumming of chords and tickling of keys, he also invited the outside to share in viewing his overwhelming collection of art an unique objects. 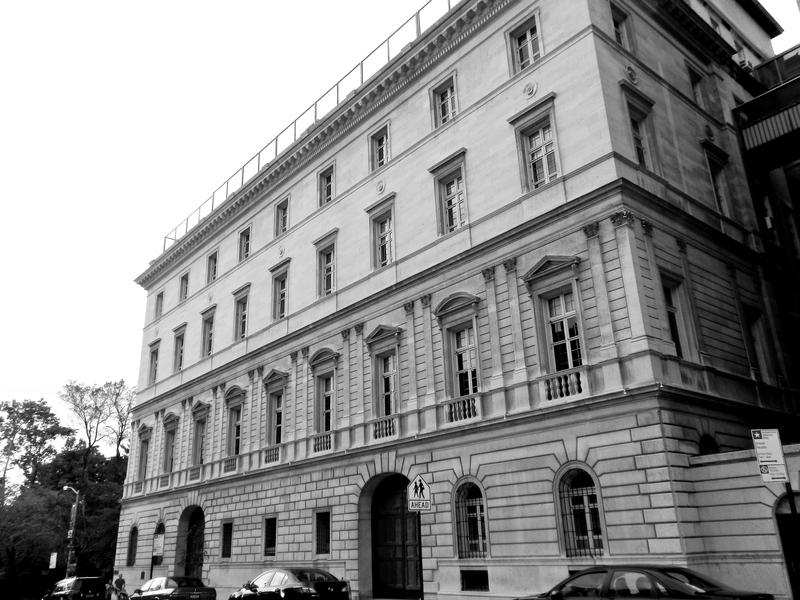 Some of the well-known musicians to grace the Fifth Avenue estate were Enrico Caruso and George Gershwin. Today, the former estate serves as the middle school for The Convent of the Sacred Heart. It was purchased by the group in 1934. 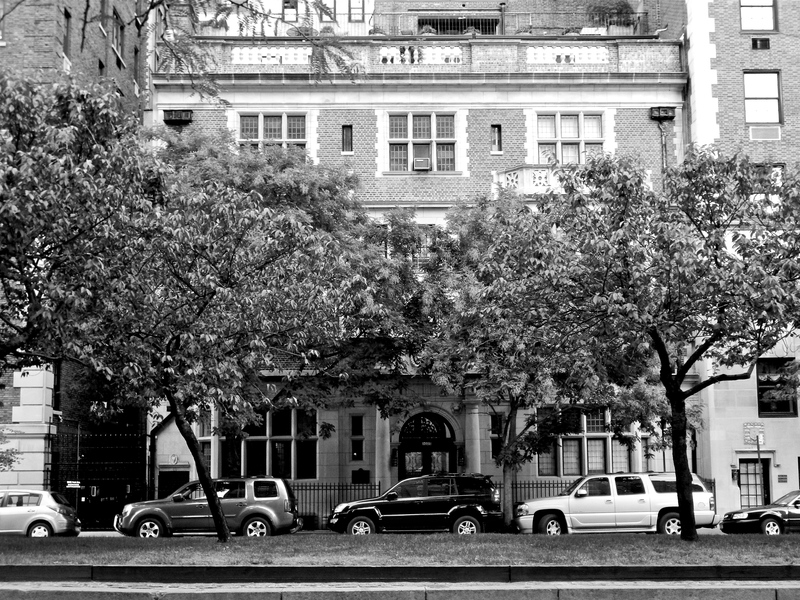 A mansion built to entertain the social elite of Manhattan; The DeKoven Mansion opened its doors to welcome its owners first in 1912. Designed by John Russell Pope, known for the Jefferson Memorial, the English countryside styled manor has graced the Upper East Side for over 100 years since its original conception on paper in 1911. Reginald DeKoven was a well-established composer. His craft lay in the orchestrating of opera and other flavorful styles of music. His wife, Anna, was a skilled writer with many literary achievements. One of her better-known pieces is “The Life and Letters of John Paul Jones.” After years of hard work and dedication, the two developed a reputation of prestige and garnered the respect of the artistic circles in the city. When the residence was initially conceived, Anna DeKoven encourage that mansion be born reflecting English heritage. The design incorporated 16th century elements found in England’s grand estates and buildings. Code of Arms can still be seen under several windows on the exterior walls today. Upon its completion in late 1912, the family hosted a New Years Eve gathering featuring lavish food and musical talents from around the city. The successful dwellers of the Upper East Side gathered for the spectacle that was one of many to come- including costume balls. 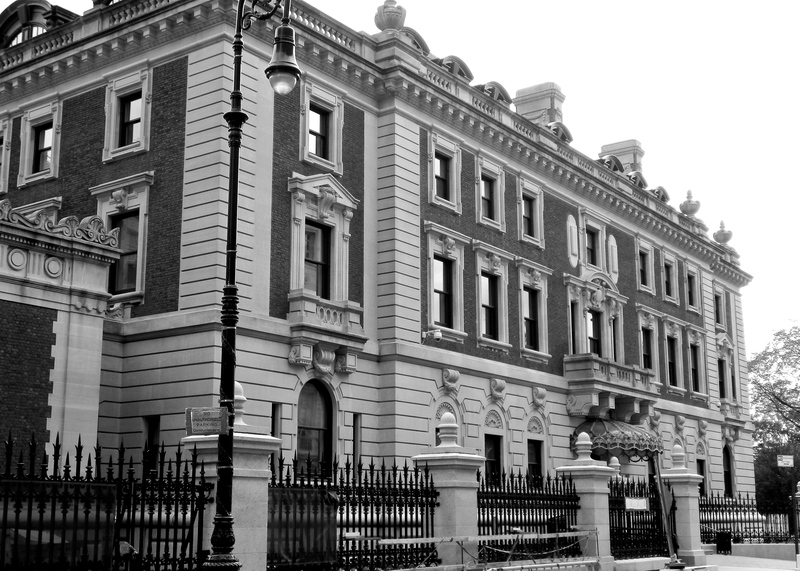 As most familiar with New York City are aware of the uniqueness of many of the characters wandering the streets, so was the general perception of the DeKoven’s mansion in a sea filled with Italian Renaissance structures and French-inspired mansions. Their English-inspired home seemed for suited for the rolling hills an hour outside of London, and the building seems even more out of place today, sandwiched between high modern high rises in a busy, commercial area. Most of the old mansions have long perished, but among the slim few still with us, the DeKoven mansion commands a momentary pause for admiration. Sadly, Reginald DeKoven passed in 1920. The home remained in the DeKoven’s possession until 1945 when it was sold off and converted into an apartment building. Like Reginald and Anna, most of the old mansions have long perished, but among the few still with us, the DeKoven mansion commands a momentary pause in a fast paced city for admiration. A resident of Brooklyn, New York, Jessie A. Robbins dreamt each night of a day when she would be among the rich and powerful of the Manhattan social scene. With her eyes set on elite balls thrown by Mrs. Astor and the Vanderbilts, Daniel C. Robbins’ daughter traveled across the East River to the hustle of the Upper East Side in 1882. Once latched to her rich, new husband, Henry T. Sloane, who owned W. & J. Sloane, a carpeting company, she embarked on a mission to lay concrete footsteps among the wealthy, social circle of the neighborhoods east of Central Park. With the signs bearing the streets 54th and Fifth in sight of her new abode, the one time outcast was now sleeping only a few doors from the royalty of America, the Vanderbilt family. Settling in to her new role among the “haves,” Jessie catered lavish parties with the goal of impressing her new friends drenched in diamonds. In 1894, the Sloane family joined the migration of fellow millionaires and abandoned the once prominent row of mansions for a more exclusive residency slightly to the north. Carrere & Hastings were employed to craft a French Limestone estate for the successful businessman and his socially starved wife. Construction was complete in 1896, but the blueprints for an Upper East Side scandal were just being realized. Talks of infidelity plagued the guests lips and tickled their ears when she welcomed a few hundred inside the Sloane mansion doors for her January, 1897 gala. One noticeably absent person was not invited, which caught the attention of many being he owned the home. Henry T. Sloane was far from ignorant. He knew his wife was cheating on him with Perry Belmont, a very rich New York City neighbor. He did not attend the ball because he no longer lived in the house they had just completed. 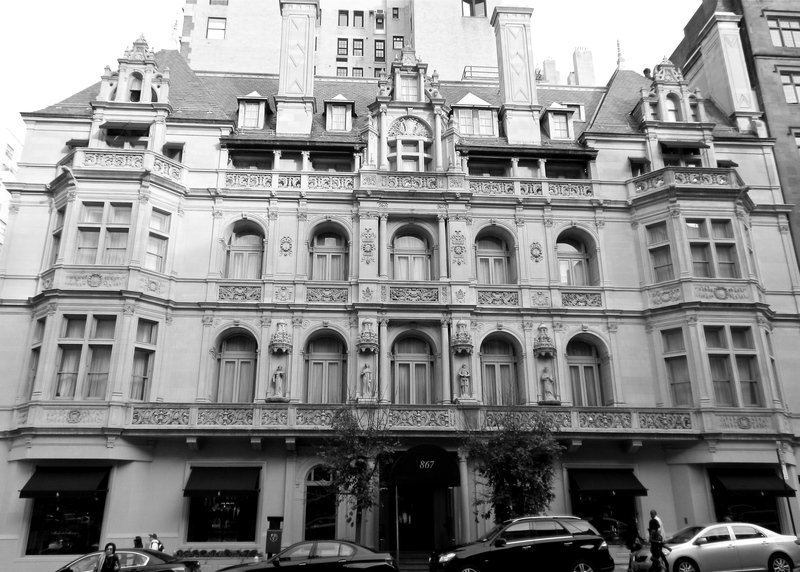 Sloane took up residency in a Fifth Avenue hotel, and followed up his departure with an official divorce in 1899 from Jessie. Do you think she was heartbroken? Probably not- she married Belmont five hours later. Today, the home is much the same as it was in the 1800s. Though it has been joined with a neighboring mansion, the $26MM estate has seen little change to its interior and exterior features, with the exception of a few facelifts here and there. A famous line is often recited when the dwellers of a home have strange behaviors. “If these walls could talk,” is often muttered in such situations. In the case of the Sloane family, I would imagine the paneled rooms are still too shocked to mutter a word. Intrigued every time by your work. Cant wait for your next project!